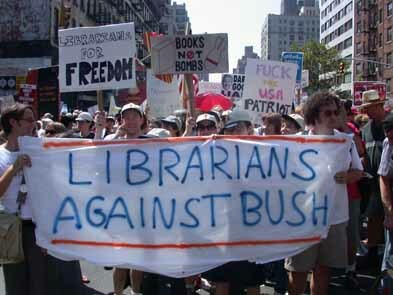 "…librarians are more freedom fighters than shushers." We support the work of activists and independent journalists. We organize within the profession on issues of justice, equity, and fair labor practices. Our work is action-driven and project-oriented. We are independent—not affiliated with any individual institutions or associations. We ally ourselves with other activist groups through collaboration with them. Free culture including fair use, free and open source software, and open access. Minimizing harm in existing power relationships (e.g. imperialism, capitalism, white supremacy, patriarchy). Promoting agency and equity for all information workers. We have used our professional skills and tools to answer information needs from the general public, independent journalists, and activists. Radical Reference members have shared their skills at several conferences, bookfairs, and other venues. Check out our presentations page for more details. The radical reference image is a combination of two concepts: The "i" is the international symbol for "information." According to symbols.com, the symbol is a "combination of symbols meaning one entity, something absolute and unique, a fact, placed beneath the "0" all possibilities." The 6 orange stripes or bars are actually a symbol from the I Ching, an ancient Chinese divination manual and book of wisdom. The 6 bars roughly translate to "Strong action will be supremely blessed. Keep on." For more on the I Ching, visit the I Ching on the Net website. ...If they had taken the time to investigate -- rather than getting caught up with the term "radical" -- they would have seen that we provide services regardless of political leaning. Remember, language is not a static thing; rather, it is a place where social struggle takes place. The term itself is interpreted within a specific social context. By using the term "radical" to define our service, we are challenging the maintream meaning which largely marginalizes the term and along with it certain groups. We face a society where citizens are less and less informed due to consolidation and corporatization of media. I think it is our core code of ethics to help to inform citizens so that they can participate fully in the democratic process. In this way, we are forwarding the profession by reaching out to the community. Every librarian should go out to his/her own community and use his/her information skills to affect positive change. If this is radical, then by all means I am radical.